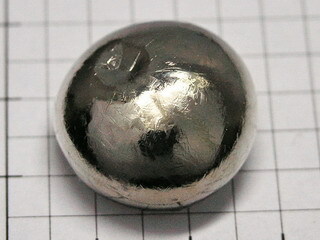 Titanium was discovered by Rev. William Gregor in 1791 in Creed, Cornwall, England and, independently, by M.H. Klaproth in 1795 in Berlin, Germany. 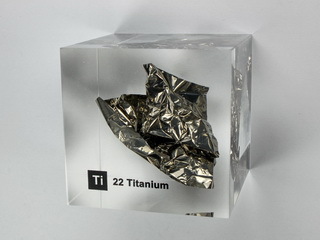 Titanium is a hard, lustrous, silvery metal which is obtained by magnesium or calcium reduction of the tetrachloride. It is a relatively abundant element, there being 5600 ppm in the earth's crust. It forms a protective oxide coating and, hence, resists corrosion, although powdered metal burns in air. 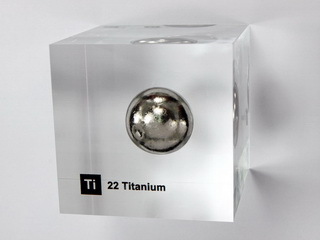 Titanium tends to be inert at low temperatures but will combine with a variety of reagents at elevated temperatures. 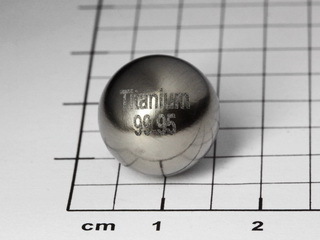 Titanium and its alloys are characterized by their lightness, strength and corrosion resistance and are used widely in aerospace applications. 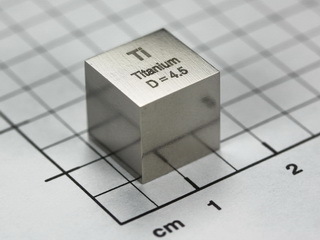 In addition, these properties also make the material suitable for medical applications (e.g. replacement hip joints). Titanium dioxide, TiO2 is used as a white pigment in paints and plastics as it provides great opacity. The same material is also used in the manufacture of heat resisting and durable glass, the TiO2 replacing certain proportions of the soda. 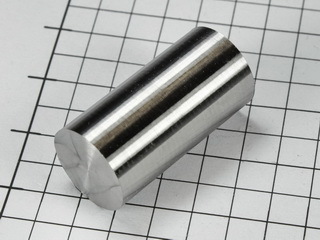 Titanium carbide is used to manufacture cemented carbides. Nice Titanium 3+ doped glass bead NEW! Pure Titanium rod 99.6% - 1 inch x 1/2inch dia.